Surgery to fuse the thoracic spine. 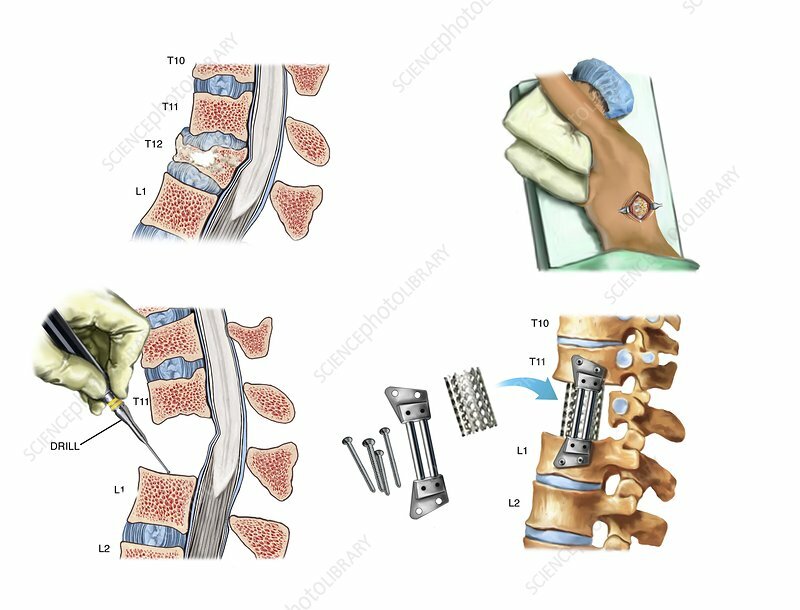 Artwork sequence illustrating surgery carried out to treat a compressed fracture of the twelfth thoracic vertebra (T12) and fuse that region of the spine. The procedure is known as decompression fusion with cage insert. At upper left is a sagittal view of the spine, showing the compression fracture of T12. At upper right, an incision is made in the side of the patient to access T12. At lower left, in sagittal view, the T12 vertebra and the intervertebral discs either side are removed and the space opened up with a drill. At lower right, fusion hardware and a cage are implanted into the space to support the spine.